LS Lowry "Home from the Pub" £600,000? Lowry R.S.A. painting sold for £689,000. An extensive collection of Signed Limited Edition art Prints and Original Paintings by the artist L.S.Lowry. 25 years experience and widely regarded as the world's leading authority on paintings and prints by L.S.Lowry. Laurence Stephen Lowry did not like to think about himself as an novice artist. so you may as well go to Art School." LSLowry started evening courses in antique art and free hand art drawing during 1905. Later becoming a student in each the Manchester Academy of Fantastic Art and The Salford Royal Technical College at Peel Park. individuals such as the Frenchman Adolphe Valette. This French Impressionist artist had made a huge impact on the artwork world. and had an affection for Pre-Raphaelite art, by artists similar to Rossetti and Ford Madox Brown. A naive Sunday artist LS Lowry actually was not. Lowry strove for a particular method of painting and drawing, and for a topic Lowry might make unique. Lowry ultimately selected the view from the Technical College window. Industrial scenes of Salford and Manchester, as opposed to that of a mannequin posing. Throughout the early years L.S.Lowry lived in Victoria Park, the suburbs of Manchester. As a result of lack of cash the household moved to Station Highway, Pendlebury. turned pretty fascinated by it, ultimately obsessed by it". (a nearby town) I had ignored for seven years, and on leaving the station, noticed the Acme Spinning Firm's mill. The large black framework of rows of yellow lit windows standing up against the unhappy, damp charged afternoon sky. The mill was turning out. "Gazing at this scene, which I had looked at many occasions with out seeing, with rapture." 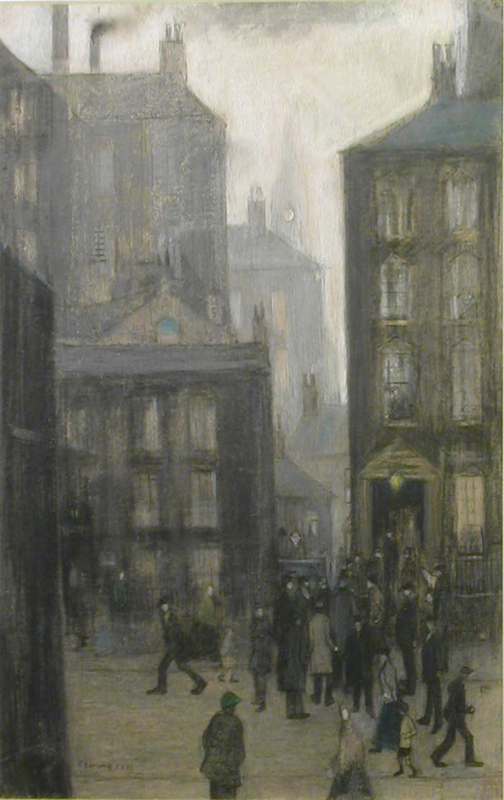 An author in The Guardian newspaper, Bernard Taylor, recognized the distinctive quality of Lowry's paintings, when he reviewed an early exhibition. "Mr Laurence Stephen Lowry has a very attention-grabbing and individual outlook. Lowry topics are Manchester and Lancashire avenue scenes, interpreted with technical means as yet imperfect, however with actual imagination. We hear a terrific deal nowadays about recovering the simplicity of vision of primitives in art. These pictures are authentically primitive, the true factor not an artificially cultivated likeness to it. The issues of illustration are solved not by reference to established conventions, however by sheer willpower to express what the artist has felt. Whether the result is in line with rule or not..."
Lowry laboured as rent collector for the Pall Mall Property Company, preferring to maintain his other work secret. Lowry did not need the public to think about him as an amateur artist. The job led to Lowry walking everywhere in the city offering L.S.Lowry with many sights and experiences. incidents, market places and Whit - processions. But all this changed, the blitz and rebuilding, slum clearances and new housing, modified the face of town Lowry had observed so well. "I saw the industrial scene and was affected by it. Attempting to draw it all the time and trying to express the industrial scene as well as possible. It wasn't easy, effectively, a camera may have performed the scene straight off". the pencil lines on the paper to build the ambiance of the drawing. This artist would typically make fast sketches on the spot on no matter what paper he had in his pockets. L.S.Lowry carefully composed his drawings in a painting room at home and took nice care over placing each figure. Late in life he would sit before a canvas or board on his easel and never know what was going to be in the painting until he started working. He would call them them "dreamscapes". LS Lowry used a really fundamental range of colours, which he mixed on his palette and painted on the white background. "I'm a simple man, and use simple materials: ivory, black, vermilion (crimson), Prussian blue, yellow ochre, flake white and no medium (e.g. linseed oil). That's all I've ever utilized in my paintings. I like oils... I like a medium you'll be able to work into over a time frame". together with his fingers and with sticks or a nail. Some paintings are painted over the surface of different images. The 1938 portray Head of a Man (Man with Crimson Eyes) when x-rayed confirmed a female portrait and probably a self-portrait underneath. Someone once asked,"What do you do along with your outdated suits?" "Wear them", got the reply! Lowry actually wore them for work, wiping the brushes on his lapels and sleeves. In 1932 the father of Lowry died . For the following seven years, his 73 year old mother became ill and fully ruled the life of Lowry. After she died in 1939, Lowry painted "The Bedroom Pendlebury" - in memory of those lengthy hours he spent there. Demanding an excessive amount of his attention, Lowry would usually only be able to arrive at his studio after dark. "My mother didn't understand my artwork, however she understood me and that was enough" Lowry said. These have been years of isolation and rising despair, mirrored in the paintings of Lowry. success came with the first London exhibition. "When the mother of Lowry died, all interest in life was lost, continuing to paint was his greatest salvation". Just when this northern artist began to have success, Lowry was changing from the subjects that everybody wished him to produce. "If it were not for loneliness, none of my works would have occurred". A few of the most powerful paintings by Lowry are abandoned landscapes and seascapes. A number of the most difficult pictures to take pleasure in are of solitary figures and tramps. "These folks affect me in a method that the industrial scene by no means did. They are actual individuals, unhappy people. Sadness attracts me, and there are some very unhappy things. similar feelings in myself". All the things came too late for Lowry, but the later years saw the British artist turn out to be a famous celebrity. Lowry also grew to become preoccupied about whether his art would last. "Will I be remembered", he asked time and again, just like the art of the Pre-Raphaelites Lowry collected and cherished, "I painted from childhood to childhood". Lowry grew to become an previous man - typically protesting to interviewers that he had "given up, packed it in". LSLowry died aged 88 in 1976 just months before a retrospective exhibition of his paintings opened at the Royal Academy. It broke all attendance records for a twentieth century artist. and steadily constructed the collection which is now held at the centre of the award-winning contemporary buiding bearing the artist's name. Celebrating his art and changing the cityscape again. A small quantity of paintings by the artist l.s. lowry have been published as signed limited prints. Three cats Alstow, Berwick-on-Tweed, peel park, The two brothers, View of a town, Road scene. The largest collection of signed, limited edition prints by ls lowry in the UK! Visit the studio in Nottinghamshire, or arrange a private viewing of prints or original paintings in your home.